I was chatting on Friday to a colleague who has just bought a house with her husband. They ended up in an area they are familiar with and like, and as a bonus, she said, it’s in zone 1. I was the same when I bought my house back in 2005 — it wasn’t necessarily the highest priority, but I wanted zone 1. From January 2015, fares within Melbourne will be capped at one zone. The government announced it in March, and the Opposition said they would implement it as well. As I wrote at the time, this isn’t necessarily the best policy, and is likely to have some side effects, pushing up fares in the longer term. But the immediate effect is a not unwelcome price cut for two zone trips. So anybody still house-hunting might as well not bother prioritising zone 1 as it won’t matter soon — though of course they may want to be closer to the city centre for other reasons, for instance travel time or liking a particular suburb. In fact, right now you may get a price advantage by buying just outside zone 1. It’s unclear if the real estate industry have cottoned onto this yet… even if individual agents are aware of it, they may be emphasising zone 1 to encourage buyers/renters into specific properties, and certainly buyers may not know. A quick look around shows Zone 1 does feature in plenty of current listings. You wont need a car as these units are located within walking distance to the shops and Reservoir train station (Zone 1). …the added benefit of being merely a casual stroll down to the Pier Street cafe precinct and a short walk to citybound rail access from zone 1 Seaholme station. …so well-located, moments from shops, schools & zone 1 station. Over time, no doubt agents and buyers/renters alike will figure it out — it may take the heat out properties in the current zone 1, and instead spread demand more evenly along Melbourne’s rail lines — though near to stations and tram lines will remain at a premium while most connecting bus services are so poor. I’ve just posted an index to significant transport-related posts, which may be of use. Remember than from July 1, a 2-hour fare will be exactly 2 hours, not rounded up to the nearest hour. ← Previous Previous post: Bike lanes that don’t disappear 50m before an intersection? Yes, it is possible. Next → Next post: Electric kettles use power. LOTS of power. It will cost the same amount of money to go from Bacchus Marsh to Melbourne as it will to go from Federation Square to the Arts Centre. Not just Bacchus Marsh to the city, but I Bacchus Marsh to Pakenham. We need more zones not less, so you do not have such a sudden jump in price once you hit that next zone. Apart from express stopping patterns don’t overlook frequency and reliability. Especially if you leave work outside the core 5 – 6pm time at Frankston. Getting home Mordialloc and Carrum all stations trains tend to be cancelled more often than Frankstons during both unplanned and planned (eg driver training) cancellations. If you don’t work near FSS you’re essentially a turn up and go passenger. 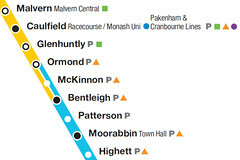 Glenhuntly, Ormond, Bentleigh and HIghett at least have reasonable tram/bus connections from the Sandringham line which is good. But otherwise the ‘sweet spot’ on the Frankston line is between Cheltenham and Mordialloc. There’s a chance of getting a seat and close to double the peak trains (half express). The chance of disruptions due to level crossing accidents etc rises with commuting distance but Edithvale, Chelsea, Kananook and Frankston still have intersecting buses from the Dandenong line (at increasing distances). Areas with limited train alternatives (eg Aspendale, Bonbeach, Carrum, Seaford) are less attractive but may have other lifestyle benefits. Frequency is also an important consideration on other lines. Alamein, Altona, Williamstown, Upfield aren’t as advantaged as others. But you will get a seat during peak. Frequency also drops on the outer part of the Sunbury, Hurstbridge, Belgrave, Lilydale lines, especially off-peak. .Still a 100% train trip to an outer suburb like Croydon or Boronia is likely faster than a combined train/bus trip to many places further in (eg Knox). There may be some lifestyle or status to living in a ‘tram suburb’ but travel speed may not always be one of them unless you cycle. But tram frequency may be good which fully offsets travel speeds, especially for night travellers. tranzitjim and Pip, we need distance based fares like other cities. Not zones. I also agree with those above. We need either distanced-based fares or more zones. Having said that, if there ever was a rethink to how tickets were priced the balance between cross subsidy and affordability ought to be a priority. I would hate for public transport to become even less attractive especially for those who live on the edges of the network whose services are limited (eg: bus service comes once per hour). If more zones were made how would one designate the boundaries? Distance? Business/Commercial/Job centers. A combination of the two? Just to elaborate on what tranzitjim was saying, assuming it’s in concrete that Zone 1 will be extended across all Zone 2 bus routes and Zone 2 VLine stations (rather than simply just the electrified train network), it will cost the same to go from Stony Point to Riddells Creek or from Lara to Hurstbridge as it does for Fed Square to the arts centre. I live inner city, use a Z1 365 day pass and will occasionally travel to Zone 2 stations in the East on weekends (all electrified btw, it has literally been more than a decade since I last travelled on VLine). Don’t get me wrong, not having to pay a $2.42 extension fare in 2015 for those occassional Z2 trips will be awesome and for those living in Lara, Riddells Creek, Wandong and Bacchus Marsh who commute to the city, if they decide to leave their cars at home because of the Zone 1 extension, more power to them! But as Daniel pointed out, the cost is likely to be offset by more above CPI fare increases overtime, especially if that piece of crap that is the East West road tunnel goes ahead. Given that EW is likely to cost $16 Billion, possibly more, to be completed in both directions, by not going ahead with EW, you could fast track the rail lines in the PT black spots like Melbourne Airport and Doncaster, still bring all of Z2 into the Z1/2 overlap and chances are there’d still be the money left over to ensure that future fare increases are in line with CPI rather than above. As I mentioned on the Twitter feed, the Z1/2 train map wrongly suggests that Z2 cuts out at Melton when in actual fact it cuts out at Bacchus Marsh (as if Z2 were still on its pre 2007 boundaries). I’m thinking of making a submission to PTV asking them that when they release the train maps to be effective 1 Jan 2015, that they take a leaf out of the circa 90’s maps with met zones along the VLine corridors (which at the time were Stony Point, Melton, Sunbury and Craigieburn). Back then they said something along the lines of “VLine service Met tickets apply”. 2015 maps could show Lara, Riddells Creek, Wandong and Bacchus Marsh as saying “VLine service Zone 1 or 2 applies”!